A new review of all studies has shown that while alcohol gets you to sleep more quickly and increases deep sleep, it also reduces the key REM sleep needed by the body. It proves that alcohol use only gives the impression of improving sleep, and it should not be used as a sleep aid. Sleep consists of two basic states: rapid eye movement (REM) and non-rapid eye movement (NREM). Typically, people start in NREM sleep, then they go into a short period of REM sleep, continuing into longer periods of both. It’s a cycle that continues all night. And according to the study, alcohol use reduces the amount of time spent in the critical REM sleep period. Even though one drink gets you to sleep faster, it also creates a more consolidated first-half sleep, and then a disrupted second-half. The more drinks you’ve had, the more deep sleep you’re getting. This is partly the reason why insomniacs use alcohol as a sleep aid. But the poor second-half of sleep ruins any benefits from the first half. RECOMMENDED: How smoking can be the hidden cause of sleep problems. While alcohol promotes deep sleep, which can make one feel rested, it can also leave you more prone to health issues, such as sleep apnea. The biggest problem, though, is the reduced amount of REM sleep, which the vast majority of studies found occurs at moderate to high levels of drinking. REM is where dreams happen. Here, the brain is more active; recharging, cleaning itself up, and getting prepared for the day ahead. REM sleep is crucial for memory and restorative functions. A lack of REM sleep can impact memory, concentration, and fine motor skills. 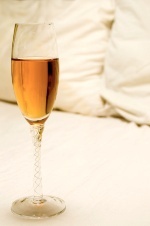 Overall, REM sleep accounts for about one-quarter of your night’s rest—if you haven’t been drinking, that is. Make no mistake: alcohol does not improve your sleep. There is no shortage of people who lean on a few drinks to nod off, because they have trouble drifting away. This is simply not a sustainable solution.